Below you'll find dozens of files that you can use when teaching the novel, Tuck Everlasting by Natalie Babbitt. 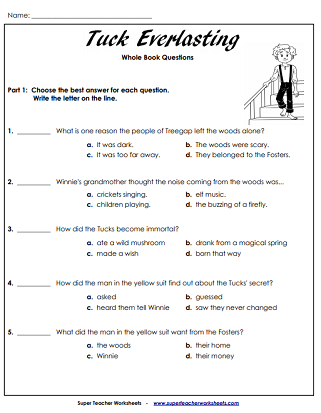 There are printable question worksheets, literature circle printables, vocabulary exercises, puzzles, and bookmarks. This worksheet has five questions about the first three chapters of the novel. What are the two reasons the people of the village left the woods alone? What is strange about the Tuck family's appearance? For this activity, students match the vocabulary words from the story with the correct definitions. Words include hysterical, forlorn, bovine, exasperated, ambled, and grimace. 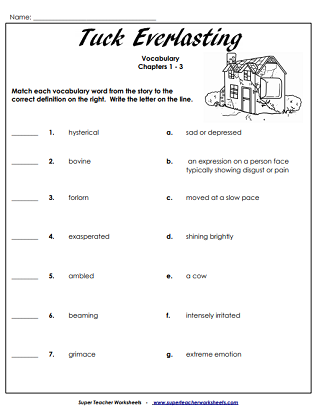 Students can practice their vocabulary words from chapters 1-3 with these printable vocab. word cards and definition cards. Questions include: What was the strange man at the gate questioning Winnie about? Why do you think Jesse Tuck did not want Winnie to drink the water in the woods? What did the Tucks do to Winnie? Why did they do it? Vocabulary words in these chapters are abruptly, intent, jaunty, marionette, precisely, sternly, and plaintively. Learn and review the definitions for this set of vocabulary words, which includes: plaintively, marionette, precisely, sternly, jaunty, intent, and abruptly. This worksheet has 4 short answer questions and one multiple choice. In this activity students will fill in the missing letters to create a word from the story. Words include eagerness, extraordinary, elated, and peculiar. Print and cut out these 10 cards for vocabulary practice. Five of them are the vocabulary words and the other five are the definitions. This worksheets asks students to choose the correct definition for the underlined word from the story. Vocabulary words include elation, silhouettes, and indomitable. Review the definitions for the vocabulary words in chapters 10-12, including: anguish, indomitable, silhouettes, elation, and scoured. After reading Chapters 10-12 ask students to think deeper about the story by answering the question on this worksheet. Who stole the Tucks' horse? Who do you think was more upset about “kidnapping” Winnie. Winnie or Mae? Explain your answer. What did the man in the yellow suit want from the Fosters? Read each sentence on this worksheet. Look up the definition of the underlined words in the dictionary and write your answer on the lines provided. Words include lingered, remarkable, and constable. There are word cards and definition cards for the 4 vocabulary words in these chapters. Try laminating the cards so they can be reused. helped her to make that decision? Can you figure out the vocabulary word? Fill in the blanks to reveal a word from the story. Vocabulary words include courteous, cahoots, and fondly. Your students will have fun reviewing the definitions to the vocabulary words with these printable vocab. cards. that happened while she was trying to help Winnie? In this multiple choice activity students will read each sentence and choose the correct definition for the underlined word. Words include ghastly, devote, and immense. Learn and review the definitions for the vocabulary words in this group: immense, mingled, ghastly, devote, and sprawled. What was the Tucks' plan for getting Mae out of jail? How was Winnie going to help with the Tucks' escape plan? What did Jesse give to Winnie before he left, and why? This activity asks students to match vocabulary words from the story to the correct definitions. Words include accusations,ebbed,exhultant, and gentility. Print and cut out the 14 cards on this file to review the seven vocabulary words and their definitions. Winnie to make more friends? What happened to the woods since the Tucks were last there? Test your knowledge of the story by answering this mix of multiple choice, short answer, and matching questions. Use the Venn Diagram to compare and contrast the Tucks and the Fosters. Read each quote and tell which character is speaking. Characters are listed in the box on the worksheet. Not all names will be used. Use heavy card stock to print out these bookmarks for your students. The illustrator draws a scene from the assigned chapters. Members of the reading group look at the picture and describe what's going on in it. We have literacy units for many different novels, including The Giver, Phantom Tollbooth, The Boxcar Children, Bridge to Terabithia, Geronimo Stilton, Mr. Popper's Penguins, and many others.